SATELLITE BEACH, Florida -- While Port Canaveral is investing millions of dollars in infrastructure for new projects in the coming decades, just a few miles down Florida's Space Coast, City of Satellite Beach officials are planning for a day when nearly all of their city is under water due to the controversial scientific theory that global warming will cause sea-levels to rise. According to a study funded by the Environmental Protection Agency and submitted to the City Council in 2010, three percent of Satellite Beach will by under water by 2040 and the city will reach a “tipping point” towards catastrophic inundation by 2050. "We're at a point where we recognize that we may have a problem in the future, and we need to sit down with the public and hash out a way to address it," City Manager Courtney Barker told NPR. 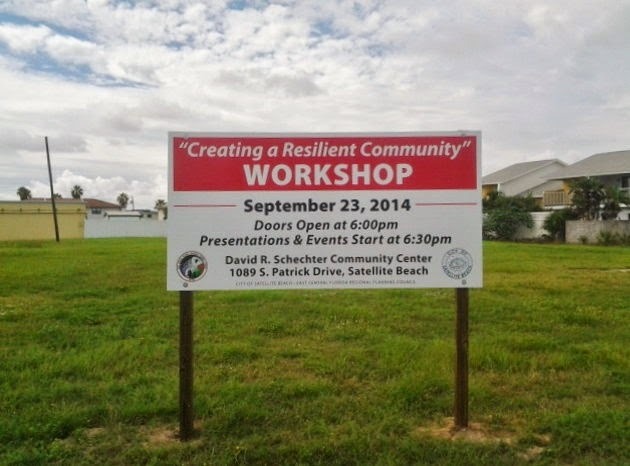 On Tuesday, September 23, 2014, from 6 p.m. to 9 p.m., the City will hold a “Creating a Resilient Community” public workshop at the David R. Schechter Community Center located at 1089 South Patrick Drive in Satellite Beach. The workshop will discuss options on how to save the City from a watery doom in the future. Tuesday's workshop is part of a climate literacy project made possible after the East Coast Florida Regional Planning Council received a $15,000 grant from the Florida Department of Environmental Protection "to focus on increasing climate literacy within the City through dissemination of educational materials related to climate resilient communities, flood-plain management, and sea level rise." Last October, the Satellite Beach City Council voted 4-1 for a matching grant of $10,000 cash plus $5,000 in-kind services for the climate literacy project, with Councilwoman Sheryl Denan voting no.